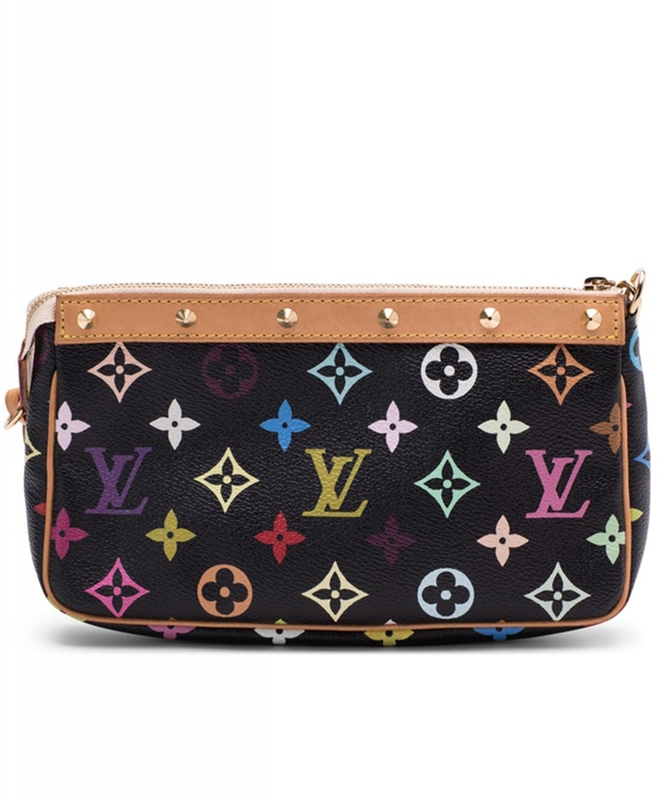 One of Louis Vuitton's most popular items, this Louis Vuitton White Monogram Multicolore Accessories Pochette Bag is ideal for holding your makeup and daily essentials in an elegant manner. It features vibrant colors embellished with golden studs. Its versatile shoulder strap can be converted to a wrist strap or removed to be carried as a clutch. Retail price is $700. 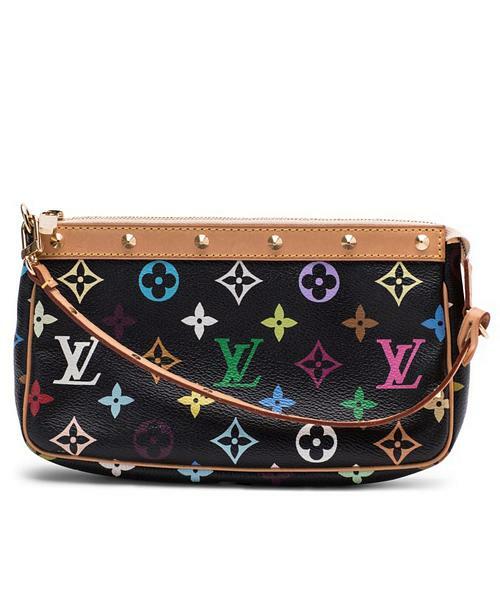 The Louis Vuitton Monogram Multicolore collection is relatively new and was first introduced in spring 2003. The Japanese pop artist, Takashi Murakami decided to revamp the traditional monogram toile and give it a splash of color. He created a new vibrant canvas pallet with 33 silkscreened colors. Together with Marc Jacobs, the Multicolore line became a huge success! Louis Vuitton (1821-1892) started his training apprenticing with a successful box-maker and packer named Monsieur Maréchal in 1837 in Paris. At this time box-making and packing was a highly respectable and refined craft. A specialist in this area had to custom-make all boxes to fit the goods they stored and had to personally load and unload these boxes for their rich clients. In only a few years, Vuitton was well-respected by Paris’ upper class in this craft, one of his clients being Napoleon’s wife. In 1854 he opened his own shop under the name of Louis Vuitton Malletier in Paris. His modern dirt-resistant and waterproof products were of such good quality, that they were soon in high demand. In addition, unlike previous domed shaped trunks, Vuitton’s were rectangular, making them stackable and far more convenient for shipping. One of the oldest names in the business, Louis Vuitton got his start as a layetier (packer) to Napolean III’s wife, Empress Eugénie. After years of studying the foundation of voyage-friendly baggage, Vuitton decided to deconstruct the model and build his own, originally designing airtight canvas trunks with flat bottoms - as opposed to the time’s rounded styles - for stacking and easy storage. In 1854 he opened his own shop under the name of Louis Vuitton Malletier in Paris. His modern dirt-resistant and waterproof products were of such good quality, that they were soon in high demand. In addition, unlike previous domed shaped trunks, Vuitton’s were rectangular, making them stackable and far more convenient for shipping. In 1886, son Georges Vuitton (1857-1936) invented the revolutionary locking system that is still used today. When Louis Vuitton died in 1892, Georges took over the company. It was Georges who designed and established the iconic LV monogram. Today, the popular luxury brand can be found internationally and has expanded its products to include clothing, shoes, handbags, jewelry and timepieces. The seventies found the brand expanding into the Asian market, with new stores in Japan, China, and South Korea. The company merged with Moët et Chandon and Hennessy in 1987, creating the luxury powerhouse anagram LVMH. Amazingly, it wasn’t until ten years later that they went into the ready-to-wear business, hiring New York designer Marc Jacobs in 1997, who immediately added an incredibly lucrative clothing business while bringing Vuitton up-to-date by collaborating with such artists as Stephen Sprouse (who irreverently graffitied bags) and later Takashi Murakami (who added a bubble-gum anime humor to the line).